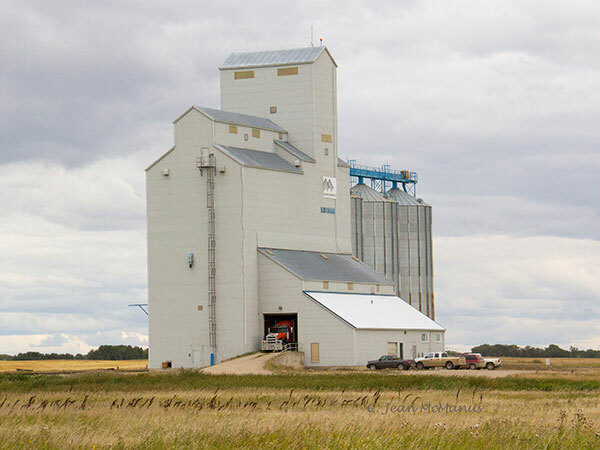 A grain elevator at the Norman Siding on the CNR Rivers Subdivision, about five miles south of the village of Oak River in the Rural Municipality of Oakview, was built between 1983 and 1984 by United Grain Growers, with an opening ceremony held on 11 October 1984. The elevator was a 40-foot by 90-foot wood crib and frame design, with the exterior covered by pre-painted metal siding. Its total capacity was 4,083 tonnes (150,000 bushels) of grain. Three large steel bins were later added on its east end, increasing the capacity to 5,500 tonnes. The complex was closed in 2005 and sold to the Canada Malting Company. Agricore United Member Advisory Group Reports, Folder 14 – Norman / Oakner / Quadra (UGG Local #444), Agricore United Fonds, University of Manitoba Archives & Special Collections.